Exponential improvements in classical processor speed, memory and integration under ‘Moore’s law’ are not sustainable due to quantum effects that pervade molecular (nano), atomic (ångström), and sub-atomic (pico) electronic/photonic scales. At the global scale, the Internet and World Wide Web effectively transcend classical space-time boundaries. Today, everyone everywhere has instant access to a vast storehouse of knowledge on a 24/7/365 basis. Quantum computers may one day replace the familiar digital computer sitting on our desks. In fact, the future of the world’s economy may one day depend on such computers, so there is enormous commercial interest in these technologies. One day Silicon Valley could become a Rust Belt, replaced by new technologies emerging from quantum computing. Quantum computers—in various stages of R&D—operate according to the rules of quantum mechanics that govern waves and particles of the very small. They combine sequential and simultaneous processing into their very nature, enabling all computational pathways to be pursued at once. Therefore, one machine cycle—one ‘tick of the quantum computer clock’—computes all possibilities at once. The direct benefit is solutions to problems in a fraction of the time required by conventional (classical) computers. Emerging quantum applications promise to directly benefit information technology, energy sciences, earth sciences, materials science, life sciences, transportation, physical sciences, financial markets, quantum simulation, multi-dimensional modeling, and quantum simulation. Quantum algorithms include quantum search, database and counting; factoring cryptography and error correction; order-finding, period-finding, and quantum teleportation. Maps foundational principles of computer science, quantum physics, mathematics, information theory, and Maharishi Vedic Science into a single model that identifies the Cosmic Computer® and Cosmic Switchboard® as the fundamental basis to computing and networking. Locates the Cosmic Computer® and Cosmic Switchboard® operating at the level of the Unified Field in terms of a computational infinity-point fabric pervading the Digital Universe®. Explains how to access the unlimited computational domain. Unfolds the direct correspondence between quantum computing and each of the forty branches of Veda and the Vedic Literature in terms of photonic (bosonic), electronic (fermionic), and pre-quantum (supersymmetric) domains. 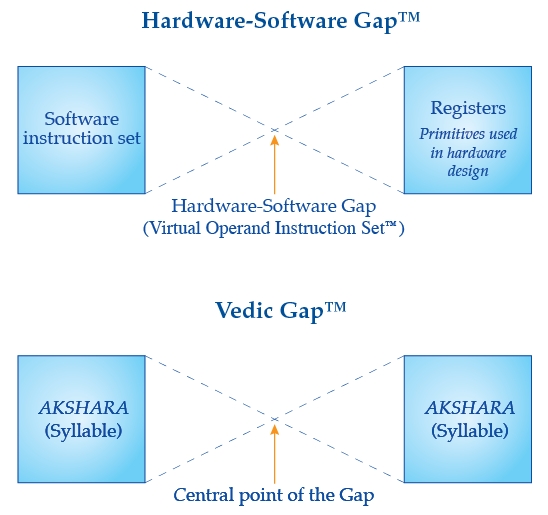 Develops the Hardware-Software Gap™, corresponding directly to the Vedic Gap™ located between the syllables and texts of Veda and the Vedic Literature. The Gap is the silent yet dynamic fountainhead of memory stationed within the totality of past, present, and future instructions. Traces the transformation of instructions from software program code to assembly language to machine language to memory via the Hardware-Software Gap™. Presents the correspondence between Vedic administering intelligence and Quantum Network Architecture™.